31 FLAVORS OF HORROR! : DEAD & BURIED (1981). DEAD & BURIED strikes me as a film underrated even by the crowds who usually stand up for films that are underrated. 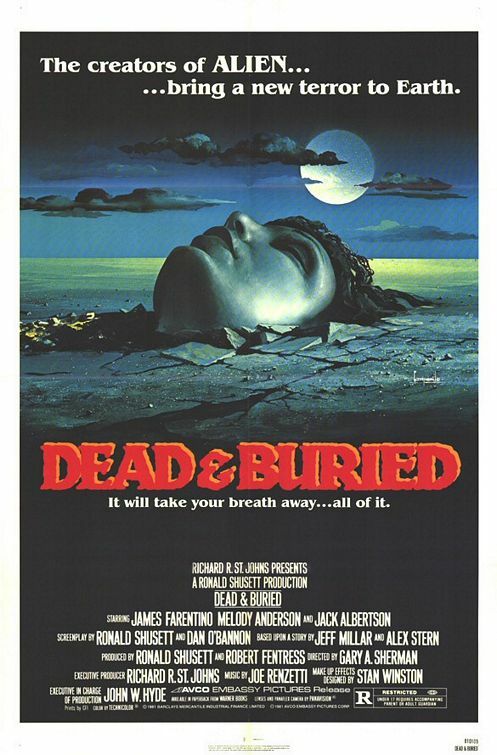 DEAD & BURIED was directed by Gary Sherman (RAW MEAT, VICE SQUAD, POLTERGEIST 3) and written by Dan O’Bannon & Ronald Shusett (ALIEN, TOTAL RECALL). These aren’t household names by any stretch, but neither are the guys who built the George Washington Bridge, and tens of thousands of people drive over that every single day, get me? Jason Zinoman’s 2011 book Shock Value does a heroic job of making the case for O’Bannon’s place in the pantheon of important horror filmmakers of the 1970s and 1980s. However, if Zinoman’s terrifically readable book has an obvious flaw it’s that it’s far too short for such a rich subject. When I went back to the book to see what it had to say about DEAD & BURIED, there was literally nothing there. This is a project O’Bannon and Shusett wrote before ALIEN, and got to make (with Shusett producing) once ALIEN conquered the world. It features early effects work by the legendary Stan Winston (PREDATOR). It’s a movie worth considering, for its historical import alone. O’Bannon and Shusett wrote ALIEN and adapted TOTAL RECALL. O’Bannon, a classmate of John Carpenter at USC, made DARK STAR with the director who would soon take off with ASSAULT ON PRECINCT 13 and HALLOWEEN. And O’Bannon wrote and directed RETURN OF THE LIVING DEAD, the movie that introduced talking zombies with a taste for brains to punk music. Dan O’Bannon is as valuable to the sci-fi and horror genres as just about any more famous hyphenate worshipped by genre film fanatics. Ronald Shusett has obviously earned his bones as well. DEAD & BURIED was originally a short story and script by Jeff Millar and Alex Stern, which O’Bannon and Shusett rewrote and then gave to Gary Sherman to direct. Sherman’s previous film, RAW MEAT aka DEATH LINE (which I will cover at greater length in a future column), is what got him the director job on DEAD & BURIED. The story needed a director who would go all the way in, and it got one. DEAD & BURIED opens on an overcast beach in Maine (actually Northern California), where a photographer has stopped to shoot some local scenery. He’s approached by a striking young woman (Lisa Blount), they flirt, and she starts posing for cheesecake snapshots. She spontaneously opens her blouse, and just when the poor guy thinks his day is made, a mob of locals appears, seizing his camera away and snapping disorienting flash photos as they beat and kick him mercilessly. They wrap him around a wooden pole with a fishing net, splash gasoline on him, and burn him alive. It’s a mightily unsettling scene, even to modern eyes (like mine) who have seen three decades of horror hence. The romantic music, the sudden boobage, and the jarring transition to such savage violence make one powerfully disturbing cocktail. And the scene isn’t even done with us yet: The local sheriff, Dan Gillis (James Farentino), and the town mortician (Jack Albertson) arrive on the scene to examine the burnt and deformed body of the photographer. They kneel in close, looking for the cause of death, and the skeletal figure SCREAMS. It’s an ingenious and upsetting scare, the likes of which we’ve seen several times since, in films as great as David Fincher’s SE7EN, but DEAD & BURIED has that film beat by a decade and a half! DEAD & BURIED is full of unnerving moments like that one. It’s a movie that was actually pared down in many markets due to its gruesome violence. The scene that was cut, surprisingly, wasn’t the one I just described, but instead a rather infamous act of cruelty that befalls that poor photographer a little later in the film, as he lies helpless in the hospital. This is only the beginning, by the way. Sheriff Gillis is called to a new crime scene every morning after that first one on the beach. The spookiness really kicks in when those murder victims start reappearing in town. Don’t go picturing zombies — these folks are as unharmed and as generally pleasant as they had been before an angry mob bashed their heads in and set them on fire. The practiced horror viewer will likely figure out the mystery before the sheriff does, but it’s the journey, not the destination, that makes DEAD & BURIED so indelible. The story crafted by O’Bannon and Shusett parcels out surprises cleverly, in a way that can be surprising even three decades later. Director Gary Sherman and his crew make the most out of their locations, making the town of Potter’s Bluff feel like a tangible environment. The music by Joe Renzetti contributes mightily to the creepy atmosphere. The ensemble cast, including a young Robert Englund (pre- NIGHTMARE ON ELM STREET), is never less than fully invested. But no discussion of DEAD & BURIED would be complete without mention of its two lead performances. When I found out that James Farentino (who died in January of this year) was a native New Yorker, I wasn’t surprised: He has a direct, grounded presence that we as the audience depend on to keep us steadily moving through a story that becomes increasingly, horrifyingly unhinged. He’s a low-key Everyman in the early goings, a regular guy whose very sanity is tested by the town’s journey into darkness. But if we could retroactively award Oscars to unheralded performances of our choosing, I might have to commandeer the time machine to ensure that Jack Albertson would get his due. 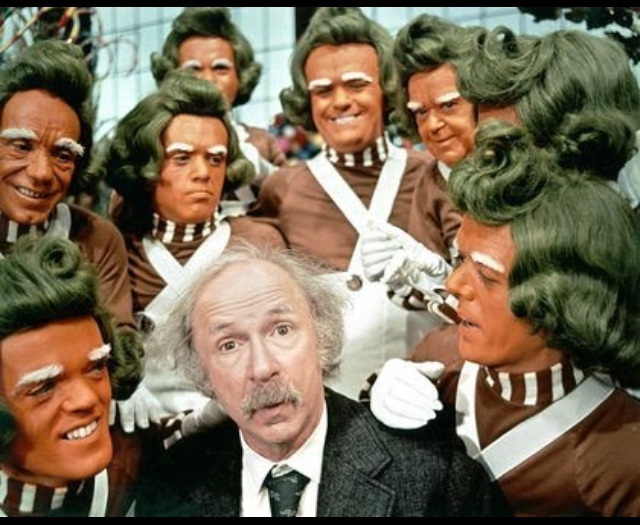 If you’re like me, you either know Jack Albertson as Manny Rosen in 1972’s THE POSEIDON ADVENTURE, or more likely as Grandpa Joe in 1971’s WILLY WONKA & THE CHOCOLATE FACTORY. Especially if you’ve seen either of those roles, in which he played the definition of the kindly old Jewish grandfather, Jack Albertson’s portrayal of the morbidly sardonic coroner Dobbs will be a revelation. He’s there to help in the investigation, but he irritates the sheriff as much as he entertains him (such as the comical moment when Gillis arrives at the morgue and Dobbs loudly mentions where his young assistant stashes his weed.) This was one of Jack Albertson’s final roles, and according to the director’s commentary on the wonderful Blue Underground DVD, he knew he was dying while filming the movie. So Jack Albertson, a vaudeville performer from way back, clearly relished the black humor and irony in the role, and played it up to the hilt. Dobbs isn’t just an eccentric with a nostalgic affection for big-band music — there are many more shades to the character, and Jack Albertson’s nimble performance alone is more than reason enough to take another look at DEAD & BURIED. DEAD & BURIED is playing tonight in Los Angeles as part of Cinefamily’s Video Nasties series. I’ve seen the poster for this before but I never really knew anything about this flick. I really want to see it now. Yeah, add it to your to-do list! I think you’ll dig it and I’d love to read your take on it. 31 FLAVORS OF HORROR! : BAIT (2012). 31 FLAVORS OF HORROR! : RAW MEAT (1972).